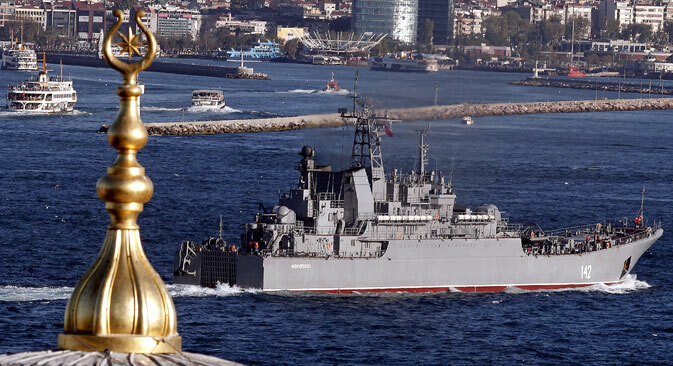 The Russian Navy Landing Ship Novocherkassk passes the Bosphorus Strait in Istanbul, Sept. 5, 2013. RBTH presents a selection of views from leading Russian media on international events, featuring reports on moves by Turkey to restrict access to the Bosphorus straits by Russian ships, Moscow’s decision to terminate science agreements with Turkey and return exchange students to Russia, and the low quality of military equipment being supplied to Ukraine by the U.S.
Turkey is creating obstacles for Russian ships without technically violating the right of free passage through the Turkish Straits, the online newspaper Vzglyad reports. According to an online vessel tracking system, Russian ships moved in zigzags and circles on Nov. 29, waiting for hours for permission to enter the Bosphorus. For instance, the Bratsk waited for permission from 10.00 to 19.00, and the Volgobalt from 3.00 to 17.00. However, as stated by the Ukrainian Center for Transport Policies, vessels belonging to the other countries passed through the straits without a delay on that day. The Haberler.com news website reports that the transport ship Yauza was met by a Turkish submarine as it was passing through the Dardanelles on the morning of Nov. 30. The Istanbul media reported the same day that at least two Turkish submarines were located in the vicinity of the Moskva missile cruiser (covering the Khmeimim Russian airbase in Syria). "Delays for Russian vessels are resulting in very heavy losses," Mikhail Voitenko, chief editor of the Maritime Bulletin website, told Vzglyad. "Turkey has just gently hinted to Russia what could happen if Russia continues to escalate the situation." The Russian Ministry of Education has prepared a draft regulation on terminating agreements in science between Russia and Turkey, the daily broadsheet Izvestiya reports. "All of the students located in the Republic of Turkey on programs of academic exchange will be returned to Russia in the shortest time possible," said the Ministry of Education's press service. The total number of Russian students studying on educational exchange programs in Turkey is no more than 100 people. It has also been decided to postpone indefinitely the signing by the Innovation Support Foundation of an agreement on holding joint competitions with the Scientific and Technological Research Council of Turkey (TUBITAK). Irina Abankina, director of the Institute for Educational Development at the Higher School of Economics in Moscow, believes that the breakup of any humanitarian relations is complicated by the fact that it will be much harder to restore them. "If joint projects are being implemented, then they need personnel, which is trained by the education system. The consequence of us shutting down this opportunity is a gap in mutual understanding regarding the implementation of further major infrastructure projects," she said. The U.S. has supplied more than $260 million worth of non-lethal military equipment to Ukraine as an aid to the government in the fight against pro-Russian militias in the Donbass region in the east of the country, the centrist daily Nezavisimaya Gazeta reports. However, claims the newspaper, some of the military equipment has turned out to be nothing more than garbage. For example, special forces on the outskirts of rebel-controlled Donetsk are using Hummers made in the U.S. in the 1980s and early 1990s, which follows from the serial numbers on these vehicles. In addition, three Hummers have plastic doors and windows, which means they lack armor protection. Meanwhile, Ukrainian infantrymen have received from the Pentagon 120 bulletproof vests of the type that the U.S. military stopped using in the mid-2000s, writes the publication. As one of Ukrainian commanders said, "If the Americans are going to send us the equipment, let them not send used items." However, the U.S. has also supplied Ukraine with new equipment, such as night-vision devices and first aid kits, as well as communications hardware and counterbattery radars. A few days ago, Ukrainian President Petro Poroshenko expressed gratitude to his American counterpart Barack Obama for the military aid to the country provided for 2016. "Thanks to President Obama for the powerful military assistance to Ukraine! This is an example of partner solidarity and support," said Poroshenko. The American leader earlier signed a U.S. defense budget for next year. It provided military assistance to Ukraine to the amount of $300 million, of which $50 million could be used to purchase defensive weapons.